"Hey Starswirl," you say, and a cloud of blue smoke appears in front of you. "A little late to be exploring the wonders of magic," Starswirl's voice sounds from the cloud. "Though I suppose you don't have to prepare the Chains of Harmony in the morning. What do you want?" "Exactly what you already mentioned - exploring the wonders of magic, or more specifically, the wonders of my own magic. It sounds like it would be really useful to know what I can do now before facing Tiamat, but who knows what I might blow up if I try to figure it out on my own." Two hearts broken, one to go. "Exactly what you already mentioned," you tell him. "Exploring the wonders of magic, or more specifically, the wonders of my own magic. It sounds like it would be really useful to know what I can do now before facing Tiamat, but who knows what I might blow up if I try to figure it out on my own." "True," Starswirl says. "The last thing we need is you spreading panic because you were inexperienced and idiotic enough to try practicing magic without knowing anything." The blue cloud of smoke opens up and reveals an empty room similar to the one Starswirl first used to delve into your mind, but much larger and emptier. Memories of being strapped to a chair while a magical force almost ripped apart an unknown power source inside you flood your mind. There are some definite risks to working alone with Starswirl, so it would be smart to take a friend along. You could always go alone and hope for the best. Besides, who would be up at this hour to go with you? Would it be best to wake them up for this? Its probably save to go alone, if he tries anything funny we should be able to fight back by now. You should be fine. You took down Gavin in the arena and you have some magical ability. If you can't defeat Starswirl completely you can at least hold him back until you can make an escape. Stepping through into the room, the smoke cloud disappears and forms a seat with Merlin reclining in it, feet kicked up on an ottoman. There are dark bags beneath his eyes and a pipe puffing smoke from his lips. "The first thing you need to know about magic is that you already know everything you need to know," he says. "Everything else…"
Merlin waves his hand and the room is filled with stacks upon stacks of books raising up to meet the ceiling. The walls flip and even more books are revealed lining countless shelves. An ash tray appears in his outstretched hand and he dumps the ashes from his pipe into it. "Any questions?" he asks, raising an eyebrow. "Do you have anything that is a bit more… condensed? I don't think I'll manage to read an entire library before tomorrow." Not all study's found in books. I've got an hour to spend tonight, and you were saying you wanted to study what I could do. Are we able to do any of that now, or do you genuinely feel that I need some reading up before we can proceed? And either way, I suppose I'll need a starting point, for now or for reading later. I've still got the perspective of a man of mortal years, and this - wave at the library - is a bit much to chew on at once. "I would love to give one thousand years to learn all you need to know," Merlin says, transforming his pipe and ash tray into a cup of tea and a spoon, "but if you want a more condensed version of anything you need to know what you're looking for. What is it exactly you want to learn to do? Magic doesn't like anything vague." "Anything that could help in defeating Tiamat would be great - I guess that could go from a shield spell to illusion or putting her to sleep to allow the Princesses to fix the chains. I have no idea which of these is the easiest to learn though, you are the magician." "Seeing as Tiamat is immune to all direct magic," Merlin pauses to take a sip of tea, "I don't think you'll be doing anything to her. But if you wish to arm yourself, improve yourself, I can point you in the proper direction. Do you wish to be stronger, smarter, faster, more resilient, resistant, down right immune?" Merlin rises from his seat, the furniture and tea poofing out of existence. The smoke that remained curling around him and transforming him into Starswirl. "Perhaps you want to change form for battle?" he continues. "Deceive your enemies? Become your allies? In truth, the only limits lie within your ability and your imagination." He trots towards you, the very cosmos opening up behind him as he gets closer. "So to start," he says, space taking up everything around you but the floor. "Let's see just how much power you have by making a simple light spell. Can you do that?" A ball of light appears in your hand and Starswirl looks it over. "Good," he says. "Now turn it into something. A shield, since you mentioned it. If you don't know how it's basically the same concept as how you made the light. You just have to think of what you want and let it be there as if it always was." Roll to make a shield. Success is any roll greater than 50. We'll probably incinerate ourselves by accident. Picturing the shield in your mind, you allow one to manifest from the light you've made. You can feel the weight of it, see the form and watch the light take the proper shape, and hold it up proudly for Starswirl to see the crescent moon emblem you've placed on it. "It doesn't look real," Starswirl notes as he taps it with his hoof. "Let's see how it holds up." Starswirl's horn begins to glow with magic power and he shoots a massive blast of magic towards you. Roll to defend. Success is any roll greater than 30. Combat modifier applies. We should just smack it back at him for trying to blast us with barely any warning. Or probably rather not, he can't teach us anything if we fry him by accident. The shield takes the full impact of the blast and you hold your ground against the force of the collision. Starswirl gives a small smile and nods. "Impressive," he says, "but how's your body holding up?" You shouldn't feel that tired after taking an attack like that, even being as late as it is, but your breathing is shallow and the weight of your body is starting to put a strain on your legs. There's a dull persistent ache in your muscles. "Not all that great. Let me guess, magic is still just as taxing as if I would do the same thing without its help?" Sounds like those muscles need some heat therapy. Send some light and warmth through ourselves to heal and re-energize. Bullshitting magic should be safe in the dreamworld, right? "The energy for magic has to come from somewhere," he says, becoming Merlin as he falls back into a newly summoned chair. "Even the princesses and I have trouble with some of the more powerful spells known to us. It's why getting rest before they forge the chains is so critical." Merlin makes his tea appear again and takes another long sip. "You have to put forth the energy needed to stop the force that comes to meet it," he explains. "Fortunately, strengthening your magical ability is much like strengthening your own body, and doing both will keep you in top shape for doing anything with either. Of course, we all have our limits." Merlin stares into his cup, swirling the tea around with his newly summoned spoon. His eyes glaze over and he lets out a sigh. "Whatever you are," he says, raising his head to look at you. "It's something I've never seen before, but with enough time, study, and practice, there's a possibility you may come to possess the same power as those of Celestia and Luna. Maybe even more." "In the long run that certainly sounds tempting. Wish Tiamat would give us a few more years." "If directly countering a force puts such a strain on me, what about illusions? Those do not directly affect Tiamat so her immunity should be irrelevant, but they also don't force us to directly counter any attack." "In the long run that certainly sounds tempting. Wish Tiamat would give us a few more years," you say. "If directly countering a force puts such a strain on me, what about illusions? Those do not directly affect Tiamat so her immunity should be irrelevant, but they also don't force us to directly counter any attack." "You're clever," he says, pointing at you. "I'll give you that. But a good illusion isn't an illusion at all to anyone but the one creating it." Merlin reclines in his seat and then splits off a duplicate of himself. Then the two Merlins split into four. "How can you tell which one of us is real?" the first Merlin asks as he stands. "Even worse," the second and third Merlin's say simultaneously as they walk towards you. "How can you tell which is fake?" "If they're both as real as real can be," says the fourth Merlin. The second and third Merlin's both place hands on your shoulder and shake both of your hands in greeting. They release you and all the Merlin's go back to their seats. "A true illusion isn't an illusion," they all say before merging into one being. "But at your level, I don't think you could make one with so many intricacies." "If those illusions weren't real illusions, what would happen if one of them was the target of an attack?" "If those illusions weren't real illusions, what would happen if one of them was the target of an attack?" you ask. Merlin laughs and says, "That statement alone is proof of your need to study." Merlin creates the duplicates again and three of them summon daggers into their hands. Three of the four Merlins then cut their hands and bleed onto the floor. When the Merlins come together again, Merlin does not have a cut on his hand. "That wound," he explains, "was only real so long as they were real. As long as there's one of us in good health, it doesn't matter what happens to the other one. We're all still Merlin. Seeing as how you are the stars, I don't see how such a concept would be difficult for you to grasp. Although I do suppose each star is different in it's own right." Merlin strokes his beard at that thought. "In any case," he says, throwing up his hands, "there's very little you can't do without magic and the power to do so. One of which you seem to be lacking for the moment." With a snap of his fingers, a puff of blue smoke appears behind you with an opening that shows your bedroom. "It's getting late," Merlin says as he changes back into Starswirl. "We can continue your lessons another time, but until then, study and try to come up with a goal as to what you want to learn…unless you have any more questions for me?" "Nothing right now. Thanks Starswirl." I'd say we try to conjure a illusion/duplicate at least once while we are still here. Better to have Merlin there in case we can't manage to merge back together again. Roll to create a duplicate. Quality of duplicate will be based on the outcome of your roll. You attempt to create a duplicate much in the same manner you created the ball of light and your shield. As the duplicate splits away from you, however, all that you can manage is a ghostly human shape that you can see and pass right through. The duplicate fades completely within moments. Starswirl laughs as you leave and says, "One day." You enter your room and the cloud of blue smoke disappears behind you. Your room is quiet. There's a bed just the right size for you, waiting to be crawled into and slept in. Moonlight pours in from the balcony and cool night air blows in through the drapes. Once you go to sleep, Luna is more likely than not going to be the only pony you'll see until morning. Her and Celestia will both be quite busy over the next few days, and while you'll see Luna in your dreams, Celestia might not be reachable. You've both gotten over your first bump in the road, but it would be nice to make sure things go smoothly with her. You're in a relationship with Luna after all and the two sisters are very close. It might be a good idea to be as close to Celestia as Luna is. Is it too late tonight? Maybe you can talk it over with Luna in your dreams? Or not? The private time you share with Luna in your dreams is special, especially now that you haven't heard from Tiamat in a while. No one could blame you for taking advantage of that as much as possible. Paying Celestia a visit couldn't hurt, if she's still awake. It should be possible to first ask Star Swirl and then go to Celestia, shouldn't it? Starswirl first. It shouldn't take too long. You call out for Starswirl and another cloud of blue smoke appears before you. "And here I thought you had nothing to ask?" he says. "What is it? I don't have all night." "Celestia said you might know something interesting about Harmonyllium and what it can be used for. I already know that you can make mirrors of it that allow to travel between dimensions good thing we didn't even try that, would have been completely useless, but apparently its quite versatile." "Something I forgot to mention. I stumbled upon some Harmonyllium. Celestia said you might have some ideas for what I can do with it." "Celestia said you might know something interesting about Harmonyllium and what it can be used for. I already know that you can make mirrors of it that allow to travel between dimensions, but apparently its quite versatile." "How you got your hands on harmonyllium is a feat in itself," Starswirl tells you. "It's true that I've been experimenting with the metal for a while now, making different weapons and things, but if you want me to make you something I need to know how much you actually have." "About this much," you say and show him the cube. "Hmm," the cloud drifts closer to the cube. "It's a rather small amount, but pure. This is good. Enough for a ring or a necklace. Harmonyllium works interestingly with certain gems, so if you happen to have any I might be able to put them into the work. Or maybe you have something to set the harmonyllium into?" Anon, do you really want to sacrifice our gift to Luna? "What kind of properties would trinkets made out of Harmonyllium have?" If we set the harmonyllium into it then we're just making it a BETTER gift. "How about this?" you ask, showing him Luna's gift. ""What kind of properties would trinkets made out of Harmonyllium have?" "By itself," Starswirl says. "Nothing. If I set the harmonyllium into something, it usually takes on the properties of whatever it's set into but with varying effects. Setting a gem into the harmonyllium object does almost the same thing, but the effect seems to be dependent on the gem itself, and even those effects can vary." "That's kinda cryptic. A ring doesn't really do much apart from sitting on my finger, or in the case of you ponies the horn I guess. So what would Harmonyllium do if you set it into it, look even more decorative?" "Harmonyllium is one of the more frustrating things I've worked with because I never know what it will do," Starswirl says as the cloud of smoke rumbles. "The best I can do is make educated guesses on what might happen. If the ring, for example, were made of certain metals, the harmonyllium might react to that as differently as a gem. It's something we won't know about until it's set into stone. You seem to have a lot of that going on about you." Dunno, that still sounds kinda ambiguous, I say we say Thank you and Goodbye for now and see if a situation where we have more of a clue what using the Harmonyllium could do comes up. But what if it doesn't come up? We could spend the whole quest with that cube sitting uselessly in our inventory. We could have him set it into the bracelet, or have the Onyx set into the Harmonyllium, but I have zero clue what either of that could do. We could ask him if the process is irreversible, if it is I'd rather keep it for now - Tiamat's chains are made from Harmonyllium, too. Could be useful for that. "Is the process reversible, like it would be with other metals, or is Harmonyllium kinda 'single use'?" "Harmonyllium," he explains, "can not be reshaped once it has been set into anything outside of its natural form, but depending on what you make, it could serve many purposes. For example, if you had a ring of harmonyllium and changed out the gems, each gem would do something different, but you could only ever use the harmonyllium as a ring." Well, in that case we should probably have him put the Onyx into the Harmonyllium rather than the Harmonyllium into the bracelet if we decide to go with this. I'm still not entirely convinced, but if the others want to do it I'm okay with that. If they decide to stay silent just thank Star Swirl, tell him we'll eventually come back on that offer and wish him a good night. We could have it made into a ring and then go buy some gems. We're rolling in bits now. Oh, yeah, that too I guess. We would need another chance to buy some gems though, I'm not sure if we'll end up on the market again. Maybe we should postpone our decision to tomorrow or something. If we get the chance to load up on gems then we can summon Starswirl and let him work his magic. Sounds like a good idea. If he could do it right now without any preparation, he can probably do it at any other point in time, too. "I'll have to think about this. But thanks for the info." "Goodnight then," Starswirl says. "Sleep well." The could of smoke disappears leaving alone in your room. The conversation with Starswirl was brief enough, so you might still be able to visit Celestia. She was working on a few things last you saw her. There's a chance she might still be awake. There's also a chance you could be up talking to her later than you intend. You could all do with some rest. Go see Celestia. Rest can wait for now. Cutting it here. I'm feeling really wiped for some reason. See you guys in this thread next week. Thanks for the run, AJ! Leaving your room, it's a short walk towards Celestia's door. You can hear a faint humming from inside with no particular tune. It has to be Celestia, because you can't think of anyone else who might be in her room. At least she seems to be in a good mood. You've never heard her humming before and she might be self-conscious about it. Teasing her might make her laugh since she's in such a good mood, and you'd be able to hear more of her humming by sneaking in. You could always just be polite and knock, but that wouldn't be as much fun. It'd be fun to be playful, but yeah we might should play it safe in the circumstances. Maybe listen a little longer at the door. Yeah, that sounds like a good idea. Stand in front of the door for a few seconds longer to listen to it before we knock. You stand in front of the door listening for a few seconds longer as she continues to hum along in random notes over the faint sounds of trotting as she moves around the room. The sound of crackling and a flash of magical fire silence Celestia and she stops. "What's this?" she says, the glow of magic from her horn shining beneath the door and the sounds of unfurling parchment sound from within room. "Oh, wonderful." There's a soft giggle from Celestia, the sound of a scratching quill on parchment, and then another magical pop. "Now that that's taken care of," Celestia sighs. "Time for bed." I guess she got a letter from Twilight or something. I guess we could ask her how the progress on the chains is going, what the plans for tomorrow look like and so on. I'm… not entirely certain. Is there something we could use another viewpoint on from our talk with Starswirl? Or anything to do with Luna? We are tired ourselves. We could ask her if she has any good idea what we should do with the Harmonyllium. Star Swirl's answers were kinda cryptic and not very specific. Or we could ask her to tell us something about Nightmare Moon. QuestAnon doesn't really know all that much about it I think. Might be okay to ask if she could spare a minute, then. Knock on the door and if she calls us in ask her if she has a minute or two for us. You knock on the door and announce yourself to Celestia. There's some arranging of papers and the sound of trotting before the door opens. Celestia stands before you, free of the armor and crown that present her as one of the princesses of Equestria. Her neck is long and slender, her legs smooth and elegant right down to her bare hooves, and her body looking much lighter without her usual attire. "What are you doing up so late?" she asks with a smile on her face. "Trouble sleeping after such an exciting day?" "I think after such an exhausting day I wouldn't have much of a problem falling asleep - but this might also be the last chance we get to talk before we have to head off to shackle Tiamat again. Who knows what she might send against us that keeps us busy." "I see," she nods, her smile fading. "Please, come in." You move past her into the bedroom and Celestia closes the door behind you. She moves towards the bed and seats herself upon it, legs tucked casually beneath her. "I'm actually glad you came to chat," she says, smile returning, if only a little. "I know we don't really have much time, but I've learned from personal experience that every moment is precious, no matter how small or trivial they might seem." What to start with… should we open with the Harmonyllium? Probably better to go with that first before we breach the topic of NMM. It also sounds like she might want to tell us something on her own. >Celestia stands before you, free of the armor and crown that present her as one of the princesses of Equestria. Her neck is long and slender, her legs smooth and elegant right down to her bare hooves, and her body looking much lighter without her usual attire. Asking her about her opinion of the Harmonyllium would be best. Either find out if we can use it to help against Tiamit, or just stick it in Luna's gift. >"I'm actually glad you came to chat," she says, smile returning, if only a little. "I know we don't really have much time, but I've learned from personal experience that every moment is precious, no matter how small or trivial they might seem." "That sounds like a story waiting to be told." Celestia laughs and says, "There are quite a few stories I could tell and not enough time to tell even one of them." Celestia looks over to her desk and then back to you. "One of them is still being told," she says and nods towards you. "I'm quite anxious to see how it ends." I actually came to ask you a few things. One of them is about the Harmonylliun - I talked about it with Star Swirl a bit earlier and he said he could fashion some kind of trinket out of it, though what kind of effect it would have he couldn't say. So now I am wondering if it would be worth it or if the Harmonyllium might be needed to reforge Tiamat's chain - they are made from the same metal, aren't they?" "Another time then, maybe," you say. "I actually came to ask you a few things. One of them is about the Harmonylliun - I talked about it with Star Swirl a bit earlier and he said he could fashion some kind of trinket out of it, though what kind of effect it would have he couldn't say. So now I am wondering if it would be worth it or if the Harmonyllium might be needed to reforge Tiamat's chain - they are made from the same metal, aren't they?" "I appreciate your concern with the Chains of Harmony," she smiles, "but such a small piece no matter how pure, would do little to help." With a glow of magic from her horn, Celestia floats a few papers off the desk and displays them out before you. Most of the pictures show the chains and what looks like a strange, craggy rock in the shape of a brain. "The chains forged to imprison Tiamat are massive," Celestia explains, "and the amount of Harmonyllium required would take too long to harvest and would be an even greater loss that the Harmonyllium we actually use." A quill floats out before the paper and taps the picture of the craggy looking brain. "This is Glaurumat's Mind," she says. "Using this, we can acquire manufactured Harmonyllium. Just as strong and powerful as true Harmonyllium, but easier to obtain and renewable." "So it's easier to get than Harmonyllium? How was that made? "Oh. I guess that makes my find less important than I thought it was." "So it's easier to get than Harmonyllium? How was that made?" "Glaurumat's Mind uses the harmony between ponies and dragons to keep the city afloat," Celestia says. "That is but one of its purposes." The parchments are rolled up and placed back onto the desk with the quill. "The harmony is stored within the Mind," she continues. "Using a spell, we can extract the harmony from the mind as Harmonyllium and forge it into the Chains of Harmony." "Not at all," Celestia says and shakes her head. "Your Harmonyllium was naturally made from the harmony that exists within the world itself, not something that was harvested from a container. The mining of Harmonyllium was banned millennia ago for fear of what it might do to our world should it be forcibly removed and used for more…"
Her head tilts as she searches for the word and she raises her hoof to her cheek. "Chaotic," she smiles and nods to herself. "More chaotic endeavors." "Doesn't extracting harmony from Glaurumat's mind put the city at risk?" "Yes," Celestia says and covers her mouth as a yawn escapes her. "That's why the spell takes so long to complete. If we take too much too fast, the city will fall." Celestia places her hoof back on the bed and uses her magic to drape herself in the white sheets on her bed. what do we want to ask about NMM, again? I don't really know - I just thought that might be something we could ask her about in general, since QuestAnon doesn't know a whole lot about it. And since A.J. is extending the pony's Universe by a bunch of stuff there might also be something we as players don't know yet, either. "If you don't mind, I also wanted to ask if you could tell me something about the Nightmare Moon incident - I don't really know much about it apart from it being an apparently less pleasant episode in Luna's past." Now that I think about it, we should actually know all about it - if we could access the memory of all the other stars. "The feelings and everything that was said between Luna and I are part of the longer version that would take more than a night to tell you about," she smiles. "To be brief, Luna's jealousy and anger towards others brought about her transformation into Nightmare Moon." Celestia's smile fades as she speaks, her eyes closing faster with each word. "I did what I could to save her," she says, head drooping forward, "but ended up imprisoning her." Celestia's next sentence comes out as more of a mumble than proper speech, but from the gist of it, you know that Twilight and the Elements of Harmony had something to do with bringing Luna back. The princess snaps awake for a moment, eyes wide and a tinge of red in her cheeks. "I'm so sorry," she smiles. "I'm more tired than I thought." "It's alright. I should probably head to bed to, its been a long day. Sleep tight, Princess." I guess the NMM story is just what we already know from the show then. "You've got a long day ahead of you. You should sleep." "Yes," she nods. "We'll have more time to talk once Tiamat has been locked away again. Sleep well." Celestia adjusts herself to her side and covers herself up as you leave. You were right when you said you should probably head to bed. It's been a long day and you could use the sleep. Luna is probably waiting for you in your dreams. You can only imagine her smiling face when you arrive, the way her wings held you when you hugged before, and you remember the kiss you both shared at the Colosseum; one from her to you and one from you to her. You'd cross time and space to kiss those lips, and if your starry counterpart is to be believed, you have. Yes, it's time for bed, but it might not have to be your bed. Dream all you like, you wonder if it would be the same as the real thing. Is the Luna you dream with the same as the Luna when you're awake? Are they one in the same or just a representation of Luna. You're a bit curious to find out and the temptation of just how you can do that is nearly impossible to resist. Either way, Luna is waiting for you. Sneak into Luna's bed and cuddle her. 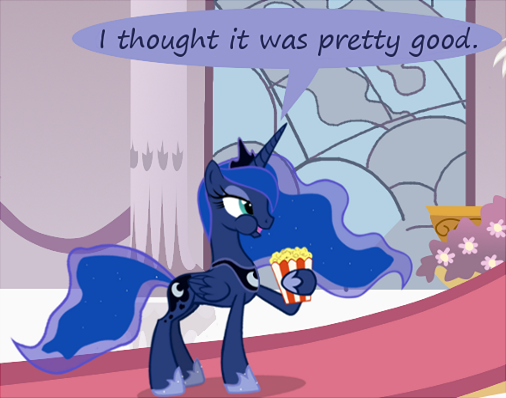 You remember that Luna's room is a little farther down the hall from Celestia's. Making your way to her bedroom door, you don't hear much of any noises coming from inside. You open the door and peek inside to see Luna sleeping in her bed with a smile on her face. She doesn't look too much different from Celestia without her armor on. She seems lighter, more free. Closing the door behind you, you walk over to the bed and ease yourself next to Luna. She's facing you, the soft sounds of her breathing are the only noise you hear above the thumping of your own heart as you come closer to her. Your hand moves to rest on her side as you make yourself comfortable next to her and she stirs for a moment. Her breathing skips a beat along with your heart and her eyes flicker open. She calls to you in a whisper and asks, "What are you doing?" Smile back at her and bury head into horse fur. Give her a short kiss. "I thought you might want company." Smling back at her, you press your face against her neck and she jumps. Your name bursts out of her whisper and she gives you a scowl, her face flushed. "I thought you might want some company," you say and give her a kiss. There's no response from her at first, but she presses her lips to yours for the moment. "It would appear as though thou-" she starts to say, before her eyes squint at her verbal stumble. "You are the one eager for my company." Luna rises from the bed with her wings, the covers falling from her body, and she lands into a sitting position. "Only if you wish to stay," Luna says, frowning. "It would not reflect well upon my status as a princess of Equestria to have a male visit my room so late and then exit in the early hours of the morning." Her eyebrows raise and she stares deep into your eyes. "Is our time together in dreams not enough?" Welp. Maybe we should just leave and let her join our dream. "Technically I'm a star and I'm not even sure if those have a gender! But if you wish I'll leave for my own chamber." Alternatively, if someone else has a better idea what to say I would also be fine with that. "Technically I'm a star and I'm not even sure if those have a gender!" you say. "But if you wish I'll leave for my own chamber." "You misunderstand," Luna says, placing a hoof on your hand and leaning closer to you. "It is true that I have feelings for you, and I know that you have such feelings for me…"
She looks down at the bed for a moment, her eyes locked on her hoof and your hand touching. She flips your hand over and places her hoof inside for you to hold. "I am surprised," she says, pulling your hand up between you. "I did not know those feelings were so strong." 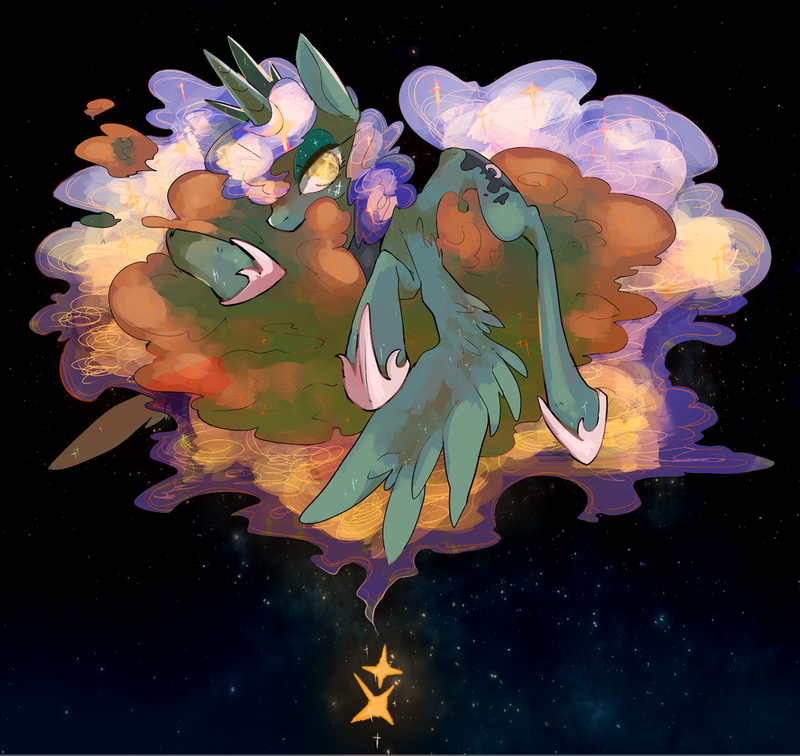 "Well, I _am_ the star's love for you personified…"
Luna looks out of the nearby window and stares at the stars. She's smiling and you can see tears beginning to form in her eyes. "All those stars," she says. "The stars that loved me for so long, that loved Nightmare Moon without fear. It is all so wonderful." Luna takes a deep breath and closes her eyes to compose herself. When she opens them again, the tears are gone and she looks at you with the brightest smile on her face. "If you would have me then," she says, her face becoming flushed again, "would you have me now? Now and forever?" "Now and forever," you promise. "And forever more." Luna laughs, placing her other hoof to your cheek and leaning forward to kiss you. Your lips meet and the universe falls still. As your actions grow bolder, the two of you become lost within each other; Luna in her stars, and you in your night, becoming the vast, beautiful, and endless space that is your love. Thanks AJ, it was great!